For real. Stand up. It's okay. Sure, it's a little awkward because there are people watching, but that's kind of the point. If you're worried someone will see you, well never mind then, you can just sit down. If you're worried someone will see you, you're not a man. I'm not talking to you anyway. You see, it's time to stand up, because for far too long, we men have been sitting with our heads down. We've been going about our lives in the least conspicuous of ways, so as not to draw any attention. We've been quietly allowing the world around us to dictate the terms of manhood in ways that have eroded any picture of who we were really made to be. This isn't something new, it's been happening for a long time, though almost no one was paying any attention. Now we act astonished that we managed to lose something we weren't paying any attention to. This is a problem because the world desperately needs real men. The world needs men who protect, who lead, who provide and who are willing to do the right thing - even when it's not easy or popular. Let's be honest, the right thing is rarely easy and it's almost never popular. But if we won't do it, then who? Just look at the world around us today. 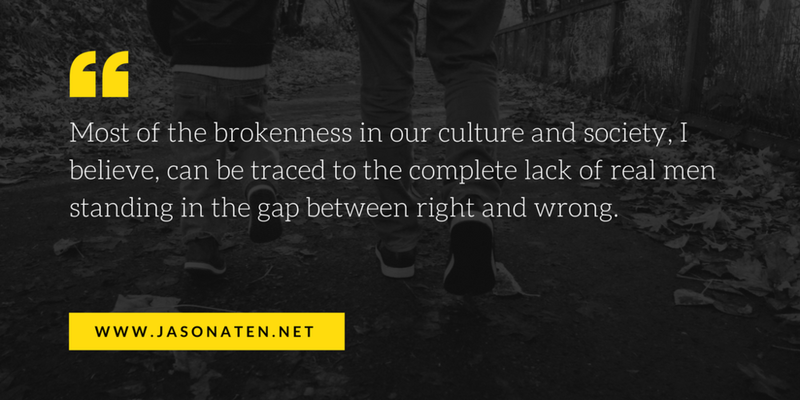 Most of the brokenness in our culture and society, I believe, can be traced to the complete lack of real men standing in the gap between right and wrong. Most of the division and fighting and ugliness we see every day, is because men have been sitting down for too long, and there is no one left fighting against the darkness that has filled in the space we have left. As a result, generations of men, especially our young men are broken. You see, doing the right thing takes courage and commitment. It means doing things that others aren't willing to do, like telling the truth. It means considering the needs of the people around you before your own. It means considering that people with other perspectives are still, well, people. It means fighting for your wife, for your children, for your family. It means maintaining your integrity even when you think no one is watching. Let's be honest, someone is always watching. Our co-workers are watching. They notice when you take shortcuts. They notice when you take credit for things someone else did. They notice when you place the blame on someone else, even when it's deserved. They notice when you cut corners, when you fail to keep your word, and they notice when you do just enough to get by. They notice. They also notice when you do more. When you do more than you have to, more than you're supposed to. They notice when you give others the credit, even when you deserve it. They notice when you're kind and helpful, and when you help them out, even when there's nothing in it for you. They notice when you invest your time in the people around you, and genuinely care about them as fellow human beings. Our neighbors are watching. They notice when you let your home become a mess. They notice when you take a week off of your yard. They notice when you are yelling at the kids as you load them in the car... to go to church. They notice when you leave early and come home late. They notice. They also notice when you keep shoveling the snow so that the elderly couple down the street doesn't have to do theirs. They notice when you play soccer in the yard with your kids, or work in the garden with your wife. They notice when you keep up the appearance of your lawn and your home. They notice when you leave on Sunday morning for church together, with your family. Our wives are watching. They notice when you spend hours on the computer late at night, alone. They notice when you're looking at your phone at the dinner table, while your children are trying to tell you a story. They notice when you wake up and the first thing you do in the morning is check your email. They notice when you come home later than you said you would. They notice when you forget to stop and pick up the thing you said you would. They notice when you lose interest in them and your kids, and instead just want to watch TV. They notice. They also notice when you do the dishes, or the laundry, or vacuum, or fold the clothes, or power wash the deck, or go out and get the mail. They notice when you offer to put the kids to bed, or get them ready for school, or make lunches. They notice when you notice them, when you ask them about their day, when you compliment them - not just for their outfit, but because they are genuinely incredible women who do incredible things for your family. Our daughters are watching.They notice when you are dismissive toward their mother. They notice when you yell at her, or them. They notice when you seem more interested in football than stories, or their dresses. They notice when you are too busy, or too preoccupied to spend time with them. They notice when you don't notice them. They notice. They also notice when you hold their hands, and make them feel beautiful and valued, without saying a word. They notice when you think they're smart, and show them you're proud of who they are as talented, amazing young women of God, with a purpose and a future. They notice when you call out beauty, not in a worldly sense, but in terms of their character and values. They notice when you pick them up, and take time to hug them. They notice when you have dance parties, and take them out on date nights. They notice when you treat them like women, and not as objects, or annoyances. They notice when you challenge them and encourage them, and build them up, not because they are weak, but because they are precious. Our sons are watching. There is no one else more dependent on your authenticity as a man, than the boy living in your home, the boy who calls you dad. He needs you stand up, and show him what a man looks like. They notice when you curse because you're angry. They notice when you yell because things aren't going the way you want. They notice when you raise your voice at their mother. They notice when you work all the time, and can't find time to coach their soccer team. They notice when you aren't at their games. They notice. You think they don't, but they do. And they also notice when you are present, and you spend time with them. They notice when you let them be boys, with healthy boundaries. They notice when you challenge them to be better, and more respectful young men. They notice when you show them that women are a gift from God, to be respected and cherished because that's how you treat their mother. They notice when you wrestle and cuddle and play with them. They notice when you read them books and build things and break things and fix things. They notice when "dad can fix it." This matters, because there are plenty of people walking around this world that never learned how to be real men. Prisons and jails are full of them. So are schools, and businesses, and governments, and churches. We see the consequences of men sitting down on the job every day. I've seen them, and I've lived them. I write not as someone who has this all figured out, but as someone who has personally experienced the pain and consequences of this brokenness in my own life. It sucked. My wife and my children suffered. Our families suffered. My businesses collapsed. My reputation was, well, shot. What I've learned that almost every man has in common, regardless of their race, or career, their net worth, or geographic circumstance, is a brokenness when it comes to understanding what real manhood is. There are millions of people who are stumbling through manhood and are carrying with them deep brokenness, and they have no idea how or why it happened. Don't let your son be one of them. There are also literally dozens, it not hundreds, of people who need you to be a real man - a man of God. The good news is, there is an example of what God designed real men to be... Jesus. Jesus was compassionate, and patient, and strong, and passionate, and protective, and courageous, and full of grace and full of love. Jesus is the example. In fact, I strongly encourage you to consider finding a local church, or men's group and walk through the Authentic Manhood 33 The Series study. It's an incredible resource and a great place to start a journey back to the man God made each of us to be. Every day we come in contact with people, in our home, our neighborhood, our work, our church, our community, who need men to stand up and be that kind of real man. The only question is, what will they notice about you?